Product prices and availability are accurate as of 2019-04-24 14:08:24 UTC and are subject to change. Any price and availability information displayed on http://www.amazon.com/ at the time of purchase will apply to the purchase of this product. This 1.25 inch Personalized monogram necklace is one of the most special and personal pieces of jewelry you can own or give as a gift. 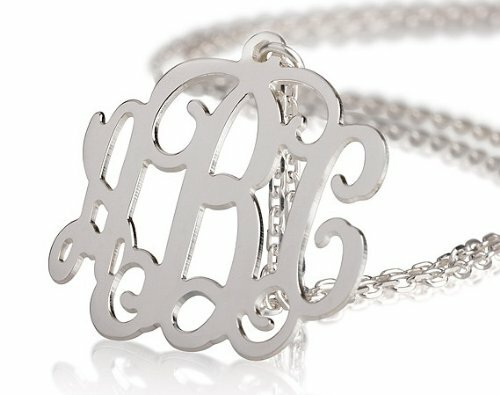 This monogram, made of solid sterling silver, measures about 1.25 inch (3cm) wide and 0.7mm thick. Pendant suspends from a Box chain with 5 choices of length: 14",16",18",20" and 22". You choose the letters and I create your unique monogram. It can be your initials (usually with the family name in the center), or the initials of those most special to you. Please let me know upon checkout in 'Gift Message': Size of chain you would like: 14",16",18",20",22". Initial you would like personalized. Additional Information Material: Sterling Silver 925/ 18k Gold Plated Chain Style: Box Chain Pendant Size: 30 mm / 1.25" Thickness: 0.7mm / 0.03" Chain Length: 14", 16", 18", 20", 22" All items are shipped within 48 hours after payment received. Personalize this necklace with 3 initials Next, find this item in your Shopping Cart and select "Gift Options" Type any 3 initials in the Gift Note box; it can be up to 3 character per necklace Please specify chain length:14",16",18",20",22"